As we begin to pray, we should first declare God’s greatness. By first recognizing God’s position we cannot avoid realizing ours as relative to Him. Last week posed the question, what if the point of prayer is not to get God to do stuff? Establishing your’s and God’s places by declaring His immeasurable greatness makes your wish list of requests vanish in a shadow of humility. 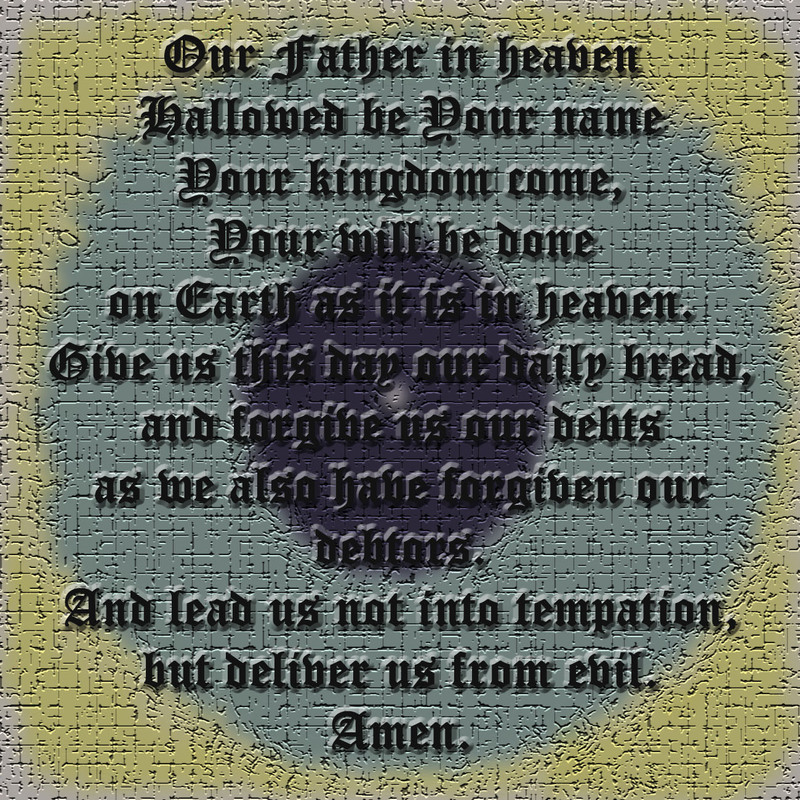 I am representing the start of prayer by the outer edge of this digital image. Light yellow with a white lining brings a sense of awe and a feeling of greatness. After realizing God’s magnificence, the next natural step is surrendering your will to Him. This is often easier said than done. Who has any natural desire to give up what they want? No one, that is why we pray for the ability to let go. In this stage of prayer we surrender all of ourselves to God. Here lies the most important part of prayer, because it is in surrender that life-change occurs. Nearly every testimony of how God turned someone’s life or situation around will be preceded by “I laid it all down and gave it to God.” Surrender is the door to growth. To symbolize surrender, the middle circle is a soft blue-grey. This hue of blue inspires relaxation, de-stressing, and letting go. Give us this day our daily bread, and forgive us our debts, as we also have forgiven our debtors. And lead us not into temptation, but deliver us from evil. Finally, acknowledge your dependency on God. Now you get back to your wish list, likely much shorter now than when you began to pray. In making your requests, you are inherently acknowledging your dependence on God to fill those requests. Tied with that is acknowledging your own inadequacy to accomplish those desires on your own. After declaring God’s greatness and surrendering your own will, submitting requests to God feels more like asking for petty favors than dispatching a super-natural force of productivity. The central circle is a deep blue, the darkness representing the shame that often comes with acknowledging our inadequacies and claiming our dependency. My choice of colors in today’s drawing is significant for each aspect of prayer, but also work together in the overall image. If you’ve taken any art classes that studied color, you will recall dark colors recess and light colors project. The center circle is darkest and the colors grow lighter as they move out, drawing your eye in and pulling your mind through the image. The decreasing size of the circles symbolizes an increased humility as the prayer progresses. One final word closes the prayer; amen. Amen is a word that dates back to early religious texts of Judaism, Christianity and Islam. The word is a declaration of affirmation that literally means, ‘so be it’ or ‘let it be so’. We close prayers with ‘amen’ as a declaration to let the outcomes of the conversation we just had with the Creator be fulfilled, it is our commitment of surrender to God’s will and promise of action to come. A simple star at the very center of the page is amen. Go into your room, pray this way in private, praying as long as it takes.